This book, based on the 1996 Brampton lectures, offers both a concise introduction to the spiritual vision of French mystic and scientist Teilhard de Chardin and a fascinating survey of contemporary themes in spirituality from that perspective. Teilhard de Chardin (1881-1955) was a French Jesuit theologian and scientist renowned for his pioneering field work in paleontology and human origins. His visionary writings on the reconciliation of faith and evolutionary theory aroused the suspicions of the Vatican and he was forbidden to publish on religious matters during his lifetime. After his death, the publication of his many books marked him as one of the most influential Catholic thinkers of this century. 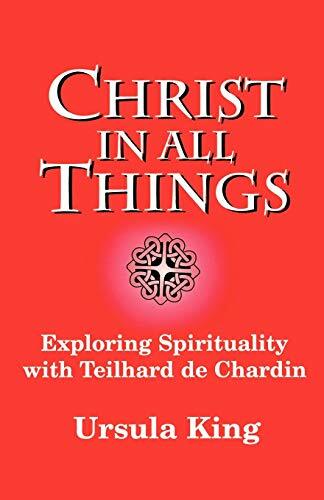 As Ursula King shows, Teilhard's personal spirituality consisted in seeing all things in Christ, and Christ in all things. This holistic vision was the underlying key to his life and thought. In successive chapters King goes on to show how many contemporary theological discussions - concerning the sources of Christian spirituality, the role of mysticism, the dialogue among faiths, the voices of women, the debates about environmental issues, the transformation of Christianity in a postmodern world, and the dialogue between faith and science - were prefigured in Teilhard's work.